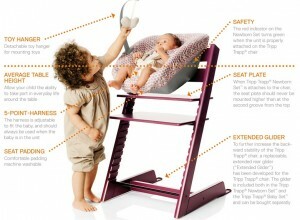 Stokke’s Tripp Trapp is the perfect alternative to your standard highchair. Instead of giving you a limited time frame for use, the Tripp Trapp really can take your child through their life from the very start and continue its usefulness as an adult chair instead of as a big old lump of plastic destined for the landfill. It may not be for everybody, but if the Tripp Trapp suits your family’s style, it’s a great choice. With the addition of the new Newborn Set(not currently available in the U.S.), your Tripp Trapp can provide a safe and convenient place for your newborn to sit anywhere in your house. This alternative to a baby seat will sit on the floor and gently rock your baby or clip onto your Tripp Trapp to move your baby right up to the table. Your baby can sit happily through mealtime right at your side or be entertained by the thoughtfully placed toy hanger.There is also a 5-point safety harness, nicely padded attractive modern print seat and an indicator to let you know that the seat is securely attached to the Tripp Trapp. Once your baby hits 6 months and is ready to start solids and becoming an active participant at family meal time, you’re all set. Just replace your Newborn Set with the Baby Set and you have a secure safety attachment for younger children (ages 6-24 months) adding a bit more backrest to make sitting more comfortable. This snap on attachment will keep your child secure in the seat until they are old enough to get in and out on their own and is dishwasher safe. You can also add a machine washable 5 point harness that you can continue to use when your child is out of the baby set, but not really ready to be fully trusted without the harness. It can be used up to 36 months and is easily adjusted. Once in the seat your child is at proper table height and ready to eat with everyone else. There is no attached tray, so your baby is right at the table. If you’ve been a standard highchair user this may take some getting used to, but it is nice for your child to sit right at the table in a chair form the start. There are no wheels, so you can’t roll your baby from kitchen to dining room, but not having a huge highchair in the dining room or taking up space when not in use is worth it, especially if you’re low on space. We have used the Tripp Trap with all four of our children. It’s biggest asset is that it can be adjusted for the child, both seat & footrest height and seat depth to give your child a continually adjusting custom fit seat. My 3 older children, 2, 3 & 5 love sitting in the chair. They like that they are comfortably at the table and have a comfy place to put their feet instead of dangling. We like that we can adjust it for any of them and knowing that this chair will keep going long past highchair and booster days. I’ve sat on it myself and it is super solid. It really can continue as an adult chair later in its life. My 1 year old used the seat with the Babyset for a month and really enjoyed being at the table with her brothers instead of off to the side in her old highchair. The only difficulty we had with her was figuring out where to put her finger foods without an attached tray since she’s not quite ready to use a plate or bowl without tossing it somewhere along with her entire dinner. Stokke does offer an optional tabletop tray, though we did just fine with a good suction bowl too. My 2 year old sits in the Tripp Trapp with the harness, while my 2 older children are old enough to go without it. The Tripp Trapp is available in 12 colors, so you can easily match your decor or just choose your favorite. I love the blue and green. The Babyset ($69.99) is available in all colors to mix or match. You also have the option of adding a seat pad that fits with the Babyset on or off. 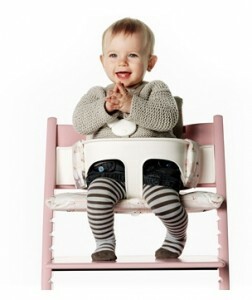 If you are using the Tripp Trapp as a highchair you should also add the Extended Glider for added stability.